The diversity of materials generated by a destructive event complicates the question. If the remains of collapsed buildings were the only debris left after a hurricane or an earthquake, the answer might be simpler. But when natural disasters hit farmland, there's also the difficult problem of animal mortality. In either case, there are ways to recycle organic materials through large-scale composting processes. When back-to-back hurricanes Irma and Maria struck the U.S. Virgin Islands in 2017, the USVI Debris Management Team began looking for ways to reclaim as much of the islands' materials as possible. Mark King, an environmental specialist with the Maine Department of Environmental Protection, was there to help with sustainable recovery efforts. The standard operating procedure in post-disaster clean-up is to ignite the air-curtain incinerators and simply burn everything. That's what the Federal Emergency Management Agency (FEMA) planned to do, King explained in a 2018 webinar hosted by the Pennsylvania Recycling Markets Center. King and the Governor's Debris Management Team pushed for a more sustainable option than burning storm waste: composting. The responders collected wood debris, ground it into 1.5 to 2-inch lengths of mulch, and used the resulting product to, among other things, stabilize a landfill that threatened to collapse into a mangrove swamp. Of course, this case study does not address the question of animal mortality. Livestock composting wasn't the solution in the Virgin Islands of 2017, according to King, but disaster recovery efforts often do include safe disposal of animals. Composting of another sort is the answer in these situations, as well. In fact, composting is the gold standard for sustainable materials management when working with organics. Much of the debris following a disaster will be organic: wood from collapsed buildings and livestock mortality. And while demolition debris from collapsed buildings must follow a very different path than expired farm animals, there is one way to neatly combine both material streams into a sustainable source of nutrient-rich compost for agricultural use. To understand how this comprehensive approach to post-disaster composting works, we need to take a deeper look into demolition waste and mortality composting individually. But first things first: Every community should have a clean-up plan embedded within their general disaster protocols. One of the defining attributes of a natural disaster is that it cannot be predicted. 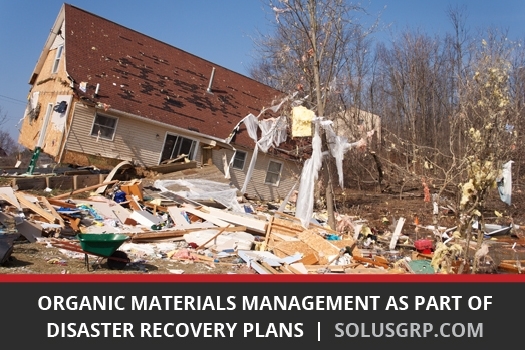 In order to ensure that materials are reclaimed following such an event, then, communities need debris-management plans in place well before a catastrophe strikes. The composition of the debris-management team. Who is responsible for collecting materials from collapsed buildings or animal tissues? Who are the haulers and the composters? Plan to include members of the public in a debris-management team, as well. This ensures that residents have a voice in the clean-up process. NERC warns that communication is the "biggest component" of any successful debris-management plan. The team should be led by a project manager, who maintains open and clear lines of communication with all participants in the recovery plan. Compliance with federal, state, and local requirements. Cities, states, and even FEMA are likely to enforce rules about handling and composting organics. Build compliance into the response plan from the very beginning. The debris-management plan should include provisions for tracking materials from collection through to final use. This is necessary for accountability, for reimbursement through FEMA, and for identification of inefficiencies. While FEMA may reimburse communities for debris-recovery efforts, the debris-management team will need access to cash to hire contractors and pay temporary employees. Set aside some portion of the community's broader emergency management funding for debris clean-up. While it's likely that a comprehensive plan will rely on multiple types of debris management, possibly including disposal and/or incineration, composting can be an extremely valuable way to derive value from materials that would otherwise go to waste. Disasters like earthquakes and tornadoes often destroy buildings, leaving behind waste that's identical to the results of a purposeful demolition. Indeed, we often call materials from damaged structures demolition (or "demo") debris even in the context of a natural disaster. And like typical demolition materials, the key to successful recycling or reuse is to know your end markets. Ideally, reclaiming teams should sort demo debris and felled trees into piles of clean organics and mixed piles of contaminated timber. In practice, residents often begin the clean-up process before officials arrive, leading to largely contaminated piles. Many of these uses for reclaimed demo debris will be familiar to waste-handling staff from day-to-day operation. However, if a natural disaster does lead to extensive livestock mortality, clean, ground organics may be part of a sustainable clean-up operation for animal tissues, as well. According to protocols published by the U.S. Department of Agriculture (USDA), a successful mortality composting project requires three things: an expert in constructing composting windrows, personnel trained to use material handling equipment, and plenty of space, water, and carbon. The base layer should consist of mildly absorbent, porous carbon materials. Wood chips ground to less than 2-inch chips are ideal. (This is where clean demo debris comes in.) Spread the base between 12 and 16 feet wide, 18 to 24 inches deep. Avoid driving over windrow bases; airflow is critical, and compression limits it. The core of the windrow consists of the livestock and compostable manure and feed, when applicable. After constructing the base, use heavy equipment to lay animals in the center, with plenty of room on either side to close the cap. Finally, cover the core with a cap of 18 to 24 inches thick. The cap must also consist of carbon material — such as mulched demo debris, provided it's uncontaminated. All told, composting windrows will be 6 to 8 feet tall. It should contain between 3 and 6 cubic yards of carbon materials per 1,000 pounds of animal. Staff only need turn a well-constructed windrow every 6 to 12 weeks, and should perform daily monitoring for temperature and moisture levels. Completed compost is suitable for roadside projects, landscaping, or fertilizing field crops. Generally, health experts do not allow the use of animal compost on vegetable crops designated for human consumption due to an increased risk of pathogens. By now, it should be clear how demo debris and livestock mortality composting can be combined into a comprehensive plan for sustainable materials management after a natural disaster, whether that's an earthquake, a hurricane, or flooding. Ground into mulch, clean demo debris makes an ideal carbon filler for mortality composting windrows. It is never easy to clean-up after a disaster, but using sustainable techniques like composting for organic materials management can put debris to good use, and even help to prepare the community to weather the next disaster safely. Bradley, Athena. "Organic Materials Management & Composting for Rural, Small, and Tribal Communities." NERC. Northeast Recycling Council, Inc., Sept. 2014. PDF. 22 June 2018. "Livestock Mortality Composting Protocol." USDA. United States Department of Agriculture, 15 Aug. 2017. PDF. 22 June 2018. "The Sustainable Materials Management Webinar Series: Organics Recycling During Disaster Recovery Efforts." YouTube. Pennsylvania Recycling Markets Center, 17 Apr. 2018. Web. 22 June 2018.